For the fourth year in a row, the United States has ranked 15th in the University of Notre Dame's Global Adaptation Initiative (ND-GAIN) Country Index. The annual index ranks 181 countries on vulnerability to extreme climate events such as droughts, superstorms and other natural disasters as well as readiness to successfully implement adaptation solutions. Since the index launched in 1995, the U.S. has trended each year at or below its previous ranking, except for 2013. This information comes on the heels of volume two of the fourth National Climate Assessment from the U.S. Global Change Research Program, which states that the country's expanded mitigation and adaptation efforts over the years have not yet risen to the level necessary for avoiding substantial damages to the economy, environment and human health. Patrick Regan, associate director of the Environmental Change Initiative for ND-GAIN and professor of political science at Notre Dame, said the ND-GAIN Country Index's data suggest that adaptation needs to take a much more central focus across our cities and towns. "Although stability in the rankings is consistent among all developed countries, the index shows a similar trend to the latest National Climate Assessment—the U.S. national efforts to reduce climate vulnerability has plateaued," said Regan. "Humans are the primary cause of climate change, and if the country wants to get serious about mitigation and adaptation, action needs to happen at the city level to address individual community vulnerabilities." 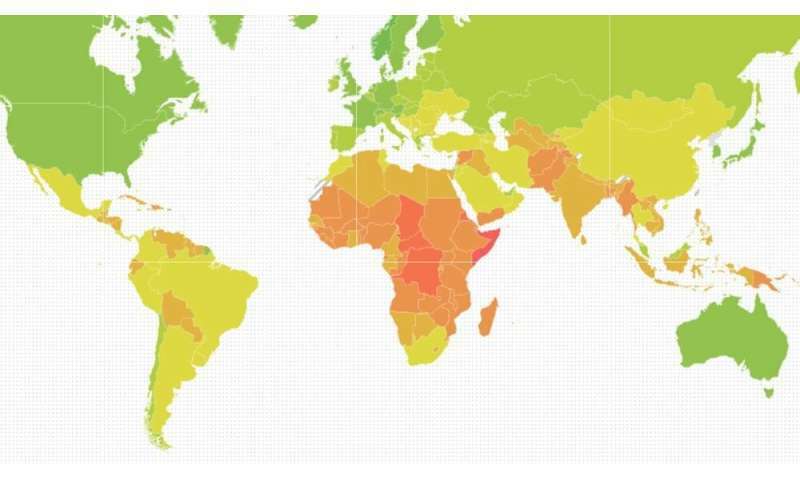 To create the ND-GAIN Country Index, researchers measure common factors of successful adaptability to climate change, such as improved economies, access to resources including reliable drinking water, agricultural capacity and political stability. Because the index is measured at the country level, city-to-city vulnerabilities are impossible to discern with the ND-GAIN Country Index. In 2018, ND-GAIN launched the Urban Adaptation Assessment (UAA) to support cities within the U.S. whose populations are above 100,000 in their prioritization of adaptation efforts. The UAA is a free, open-source measurement and analysis tool that explores a city's ability and readiness to adapt to climate change. Through detailed visualization of adaptive capacities and social vulnerabilities at the sub-city or neighborhood level, the UAA can inform the development of strategies and adaptation preparedness across communities. "Where the Country Index shows an overall ranking on a global scale, the UAA was created to be a starting point for U.S. cities by providing details with the projected cost and probability of climate-related hazards, such as drought, flooding and sea level rise, in 2040," said Regan. "Now communities have this interactive tool to explore the connection between vulnerabilities and climate hazards, and help them decide which climate adaptation strategies to enact locally." ND-GAIN's full country ranking, country profiles and visualization tools are available at gain.nd.edu/country, while the UAA database, funded by The Kresge Foundation, can be found at gain.nd.edu/urban.